And American workers view incivility as a serious problem that’s only getting worse. 98% of workers report experiencing uncivil behavior, and 40% say they’re looking for a new job as a result. The American Psychological Association estimates workplace stress is costing our economy $500 billion a year. Plus, uncivil workplace behavior ultimately impacts the people you serve. This complementary webinar delivered by Theresa Holland and Jann Gillingham will explore the causes of this phenomenon, why organizations often fail to recognize it or take action to curtail it, and the human and organizational costs. Join us and receive real solutions for confronting this challenge head-on to reclaim civility in the workplace starting with more effective hiring. 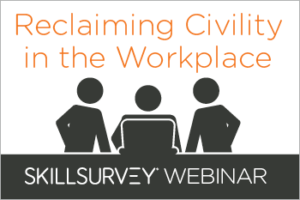 View this on demand webinar, Reclaiming Civility in the Workplace, and uncover the causes, costs, and cures for workplace incivility. *Civility in America 2016, the ongoing poll by Weber Shandwick and Powell Tate with KRC Research.